Bigar Spring commonly known as Bigar Waterfalls is a protected area under nature reserve IUCN category. It is located in the administrative territory of Bozovici in Caras-Severin County in South-western Romania and is the natural reserve in Anina Mountain, one of the most amazing and unique waterfall. The water tends to fall from a cliff which is covered with moss and is said to be the most beautiful waterfall in the country. The underground spring is said to stream from the caves above and falls into Minis River. Bigar Waterfalls is one of the most popular waterfalls in the world which is found in Oravita, a city in Caras Severin County attracting various tourists to its exceptional site. 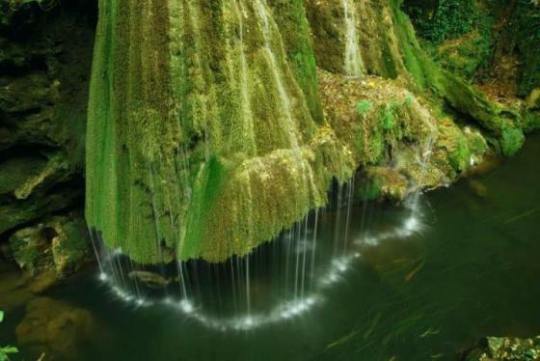 It seems like a massive mass of falling water dressing a huge rock that is covered by moss and the rocky base of the waterfall is covered by green vegetation. It has a wider base which gives it an appealing and original appearance and the most amazing sight of the waterfall is the water cascading over the green rock with beautiful clear glows which resembles an oversized diamond. One can explore this 200 meters river which forms the waterfall and follow its course upwards from where it springs forth. Besides this there is also a small cave that can be discovered, a tall hole carved in the hard rock wherein to enter it, one could cross the city river bare foot and then climb a latter of rope and sticks. Bigar Waterfalls having an area of 175.60 ha, had been declared by the Law Number.5 of March 6, 2000 as a natural protected area. According to the World Geography, there seems to be a number of facts which place this destination as number one on the list of eight unique waterfalls all over the world. This is owing to the way the water spreads and tends to fall in tiny shred of water as well as the fact that it is situated precisely on the 45th parallel north, towards the halfway point between the Equator and the North Pole. The Bigar Natural Reserve comprises of a spasmodic natural spring, a stream, a cave and a waterfall which is all placed towards the Almajului Country towards the right side of Minisului Gorges. The locals in Banat use the name of `izbuc’ for spring from which the water comes to light from beneath the rock and the water of the Bigar spring comes from under the rock which is more than 50 meters high. Some of the water of this spring is of a rare purity and is routed to Minis trout farm. From here, but above and towards the peak of the cliff lies the hole of the cave with water where the water from Bigar creek tends to fall from time to time creating a line of small waterfalls so that the water is occasionally clear and foamy. At a distance of around 200 meters from the sporadic spring, the water runs into Minis River from a volcanic tuff cone of seven meters high forming the Bigar Waterfall which has its own unique beauty. The rock cone of green moss together with water that falls on it looks like a dress of the mountain bride.